Bali – An alluring seductress with scent, sight and sound. If you visit once, you will want to go back again and again. Fresh papaya juice at breakfast, soft sea breezes, rolling waves to lull you to sleep, children laughing and flying handmade kites, the other-worldly beauty below the ocean surface. Join this trip to the northern coast of Bali. The island is small and accessible, only 100 miles at its widest point, with live volcanoes, palm trees, ocean breezes, gorgeous, fertile rice terraces and citrus farms in the hills and corn fields near the coast. The only Hindu island in the Indonesian archipelago, celebration of religious ceremonies permeates all aspects of Balinese life. 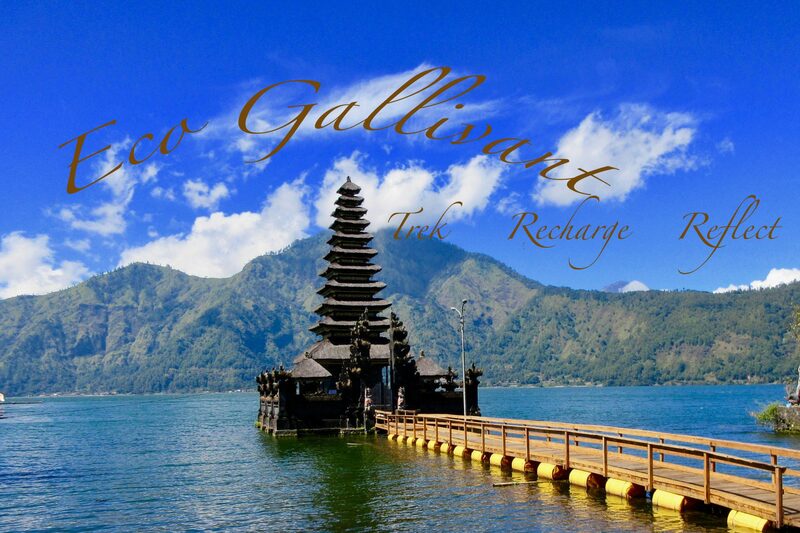 Come and experience Bali as a traveler, not a tourist. 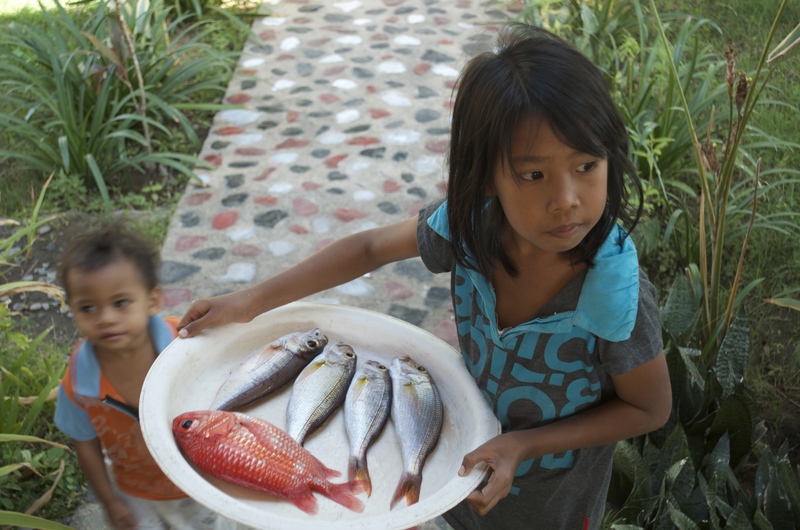 With the opportunity to become part of the community in the small fishing village of Les on the rarely traveled north coast of Bali, you will be creating experiences of a lifetime that will never be forgotten, and you will become a friend forever. This Balinese trek will feature food, festivals, religion, art, music, yoga flora and fauna, and the scents and flavors of Bali. Derek and Kerry, based on their varied travels around the world, have carefully planned the itinerary with Tejakula and Les Village as home base, with day trips throughout the northern part of the island. You will enjoy experiences you would never discover on your own, experiences that are not offered through any other travel group. Please consult the Itinerary below, and then sign up for this trip. Make your decision quickly! Limited to only nine travelers, this trek will fill quickly. Ideal for single individuals, mother/daughter pairs, partners, or friends. If you have any questions, please feel free to contact us. We will meet in Chicago – O’Hare International Airport Terminal 5 at 9:30 am to check into our flight on Korean Airlines. It’s a quick, smooth process! Once we wind our way through TSA, we can relax for a bit before we board for Bali! There is a very short stop in South Korea (now you can say you’ve been there!) before we switch planes for the final leg. Relax, put your feet up, nap and enjoy the meals. We are almost there! Arrival in Denpasar is scheduled for 12:10 am. It’s a great time to arrive because the lines are short and the bags are on the carousel quickly! Early morning arrival at Ngurah Rai International Airport in Denpasar, Bali. Since we are traveling there as a group, our Elf transport will meet us there and take us directly to the northern coast of the island. As we head north, we will leave the congestion of southern Bali behind, climbing up through the foothills to the cooler mountain tops, past the side blackened volcanic calderas of northern Bali; a breathtaking sight. Over the top of the central mountain range, we will corkscrew down through clove and citrus plantations until we emerge onto the north coast highway. This is a busy two-lane road filled with motorcycles and lumbering trucks by day, but at night it is quiet and you can sleep in our comfortable transport until we reach our villa. A very early arrival in Tejekula where we will settle in. Eat a little breakfast, relax, and at 10:30 am we will have a yoga class to get all the flight kinks out of our backs! We will then head to Les Village and Segara Lestari Villas and Café. After lunch there, we will hear the story of the reef devastation, and the rehabilitation program the fisherman in the village have been working on. Next, we will have a snorkel tour with local fisherman, walking directly into the sea in front Segara Lestari villas. After rest and relaxation in the gardens next to the sea, we will have dinner at Segara Lestari Café. No bathers in bright swimsuits, beach chairs or powdery sand here, just an unspoiled black-volcanic-sand beach lining the aqua sea, with the sound of gentle waves lapping on a rocky shore. The only people you will see will be the fishermen walking along the sea wall with the day’s catch after pulling their boats up on the beach, and children delightfully flying their homemade kites. Back home to our villa in Tejakula – a quick 15 minute ride. We will enjoy a healthy and delicious breakfast in our villa. Today is a time to relax, soak in the beauty of Bali, and acclimate to a 13-hour time difference (we are a day ahead of the Midwest!). Relax, swim in the pool or the ocean. Guides will be available if you want to snorkel. At 10:30 am we will have a one-hour yoga class (you may opt out if you would rather just laze by the pool!). Lunch will be served in our villa. After lunch, continue to enjoy the palm fronds above and the sea in front of you. You will be treated to a one-hour professional massage in the privacy of your room. Fall asleep afterwards if you would like! For dinner, we are headed to Warung Tasik for pizza made in the outdoor wood fired oven, salad, and dessert. The warung is next to the sea, and we will be entertained by gamelan music and local dancers. Early breakfast, because at 8 am we will board our Elf for a trip to Munduk; a short ride up the side of the mountains, past rice terraces and fruit plantations and through small villages. The first stop will be a Pura Beji. This Hindu temple built in the 15th century is dedicated to the rice goddess Dewi Sri, and is revered especially by the farmers around the area. It is one of our favorite temples in Bali! The high point of our day out is our next stop, the Bali Botanical Gardens. This garden is Indonesia’s largest Botanic Garden, containing the country’s biggest collection of wild orchids, a tropical rainforest trail, a carnivorous plant collection, traditional Balinese medicinal plants, and over 100 species of bamboo. Nestled in the refreshingly cool, mountainous region of Bedugul in central Bali, the sprawling, peaceful, 389 acre garden is a mix of green, open space, landscaped gardens, unique plant collections and remnant tropical forest set against the misty slopes of Tapak Hill. After lunch, a short drive will bring us to a gorgeous water fall hike – Bhuana Sari Waterfalls in Wanagiri, Buleleng. This is by far one of the most beautiful waterfalls in Bali – unknown to most, untouched and thus spectacular! After a gentle trek down of about 20 minutes, you will come upon the water as it bursts out of the rocks and foliage above and then cascades smoothly to the ponds and river below. Absorb the thunderous sounds among the rich green plants surrounding you. Take a cool dip in the fresh, clear water and awaken all of your senses as you listen to the flow of water and the birds chirping. There will be a surprise stop on the way back to our villa! Early breakfast again, and then we will board our Elf for Menjangan Island, which is part of the West Bali National Park. We will cross over to this small island by boat from the port of Labuhan Lalang. The island is home to the rare Javan rusa deer, locally known as ‘menjangan’ (Cervus timorensis) and which gave the island its name. Down at the coastline, calm waters and coral gardens teeming with marine life offer snorkeling with excellent visibility and an abundance of sea life. We will eat our banana leaf (box) lunch on the boat in between two gorgeous snorkeling sites. On the trip home, we will make a shopping stop at a huge mall….. unique in Bali! Then on to Buda Café for an incredible French dinner and dessert. After a long, sweetly exhausting day, we will go to bed early in Tejekula because tomorrow is a sunrise day! A very early wake up call, but we guarantee it will be worth it. A sunrise boat ride with the fisherman from Les, in their traditional fishing boats. Skimming the waves heading north, away from the island, we will be searching for the sight of leaping dolphins. At the same time, we will watch the sun rising over the eastern horizon, with golden rays lighting up the incredible green of the palm trees and mountains behind us. We will return to our villa for breakfast, water fun, and yoga for an hour at 10:30. Work out those kinks and relax at the same time! After lunch, time for a massage in the privacy of your room. Take a little nap after a busy day! We will be having a cooking lesson in our villa’s kitchen incredible cook, Made, and then we will eat the Balinese meal we create! After dinner, listen to music, relax with a good book, swim in the pool, or chat with friends. After the last breakfast at our beautiful villa, we will say a sad good bye to our new friends (and promise them we will be back) then board our Elf at 8 am. It is a gorgeous ride to Jatiluwih. You cannot but be amazed by the beauty of the thousands of acres of lush green fields that cascade in terraces from the upper reaches of the volcanoes down to the deep valleys below as if sculpted from the mountain side. The Jatiluwih Rice Terraces in the heart of Tabanan Regency is the best example of Bali’s outstanding picturesque rice fields, which was inscribed a UNESCO’s World Heritage Site in June 2012. We will be meeting Arya and his crew from Bali By Pedal at the peak of one of the hills. While fitted up for our bikes, we can fill water bottles and have a cup of coffee or tea before we set off. All down hill! We will make stops to walk into the terraces to see the farmers working, and give rice farming a try ourselves! Stopping by the side of the path we will grab a freshly picked coconut and ask Arya to chop of the top so we can have a refreshing treat. A delicious lunch will be served before the end of our ride. If you prefer not to ride, a truck will be following us so you can still enjoy all the fun! At the end of our ride, and further downhill, our Elf will meet us for the ride to Ubud. Ubud! The cultural center of Bali, with busy streets and shops and restaurants and night life!! We will check into our villa, and have a little down time. Then we are up and on the street for an excellent dinner and a performance. Stay up as late as you want! We will be sleeping in tomorrow (relatively speaking!). Breakfast at Habitat at 8:30 am. Cappuccino, avocado on toast, fresh kombucha: all kinds of good stuff! After a leisurely breakfast, we will hit the market and the shops. Shop till you drop! We know where to buy inexpensive sarongs, silk scarves, or on the opposite end of the spectrum, original one of a kind indigo batik! The guided walk and workshop will take you on a journey of discovery from plant to product and is not to be missed. We will have a short time to rest at our villa, and then we are off to Hana Warung for dinner. Bali meets Japan in this eclectic little café! Saturday April 20th – Ubud. Would you enjoy chocolate croissants and lattes for breakfast? We know just the spot! Then we will walk over to the ARMA museum. Our guide will meet us there for a personalized tour of the beautiful grounds of this privately owned museum. The collection ranges from traditional to contemporary, including classical Kamasan painting on tree bark, masterpieces by Batuan artists of the 1930s and 1940s and the only works to be seen on the island of Bali by 19th century Javanese artist Raden Saleh and Syarif Bustaman. Foreign artists who lived and worked in Bali are represented by Willem Gerard Hofker, Rudolf Bonnet, and Willem Dooijewaard among others. The works of German painter Walter Spies have a special place in the collection because of his important contribution to the development of Balinese arts. The grounds are resplendent with native trees, orchids, and stunning sculpture. After delicious Balinese iced tea or coffee in the restaurant, we will enjoy lunch on our way to our special spa treatment. Ubud is renowned for it beautiful, pampering, spas. We will introduce you to our favorite – Ubud Wellness Spa. There we will indulge in traditional Balinese therapeutic massage, which uses a combination of palm, thumb, forearms and elbow. The massage is effective for relieving muscular cramps and soreness, as well as restoring energy flow, helping to balance the body, mind and spirit. Delicious! After this rest and relaxation, how about a pasta dinner!? We will end the day with a traditional dance show at a nearby temple. Breakfast at coffee shop extraordinaire Seniman, and then more time to shop. We have to bring home gifts and souvenirs for friends and family! You can choose to accompany Kerry on this last spree, or take off on your own. We will meet up again at lunch. Then, sadly, it is time to pack our bags and load them into our Elf. We are stopping for dinner at Moksa on our way to the airport. A restaurant that creates and presents healthy food in the most extraordinary and inspiring of manners, in a space that inspires beauty and creativity, with an attention to detail that encourages a second and third look as an appreciation to the depth of character of everyone and everything involved. From exploding your taste buds with extraordinary food options, to opening your eyes in an ambience of raw elegance, from architectural structure to ceramic dish-ware. This is the perfect goodbye (for now) to Bali. Monday April 22nd – Arrival in Chicago at 10 a.m. Sad goodbyes! Please travel with us again!! !